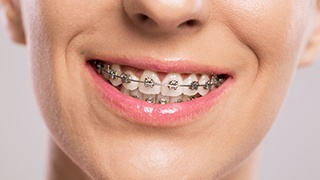 There are plenty of adults out there in the world who wish they had straighter teeth, but at the same time, they can’t imagine facing the world every day with a mouthful of metal braces. Fortunately, Ridgepointe Dental is able to help those individuals in this exact predicament. We’re happy to offer two orthodontic options that are perfect for today’s working, sociable adult. With either MTM Clear Aligners or Six Month Smiles, we can help adult patients get the straighter smile they’ve always wanted in the most discreet way possible. What if we said that you could get your teeth straightened with a treatment that no one would notice? With the MTM Clear Aligner System, that’s exactly what we can do. Using a series of custom-made clear plastic aligners, the MTM system can gently straighten your teeth and help you maintain your daily appearance at the same time. In addition to being practically invisible, the aligners are also easily removable, meaning you’ll never have to worry about your treatment when eating or brushing your teeth. Many adults could benefit from orthodontic treatment -- and now, it’s possible to do so without having to put yourself through a year or more wearing metal braces. 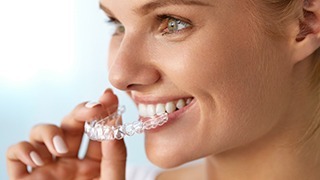 Invisalign clear aligners offer a subtle alternative to traditional orthodontia that can help you smile with true confidence. Good for crowded, gapped, or otherwise misaligned teeth, Invisalign has already helped so many of our patients achieve the smile of their dreams! With Six Month Smiles, we can give you a straighter smile in less than a year, which is something that simply can’t be done with traditional braces. Six Month Smiles uses the latest orthodontic technology to create a treatment that is not only fast but subtle looking as well. The key to Six Month Smiles is that it only moves the teeth that show when you smile. Because fewer teeth are being moved than with a typical braces treatment, they are able to shift much faster. Plus, Six Month Smiles brackets are entirely clear and use tooth-colored wires, so you’ll be able to flash your smile with confidence both during and after treatment. If you think it’s too late to straighten your teeth, we’re here to delightfully tell you that it’s never too late. With our orthodontic options, you can straighten your teeth and not have to worry about your day to day appearance. If you’re ready to get your perfect smile, please contact us today for an appointment.